I am almost at the second completed color way repeat—and rapidly approaching the heel. For theses socks, the heel will be an after though (or really a before thought—since I will be working a row of waste yarn for the heel placement) –I really like this sort of heel for a self striping yarn—it allows the striping pattern to consistent on the instep—and with a small effort, total matching down the back of the leg. Normally, I do a small gusset on the front of socks but with the cable pattern running down the side-- the gusset has to be on the heel side of the cable. So for these socks, I’ve been increasing on the heel side—and will incorporate the extra stitches into the heel—making it a bit deeper than average. 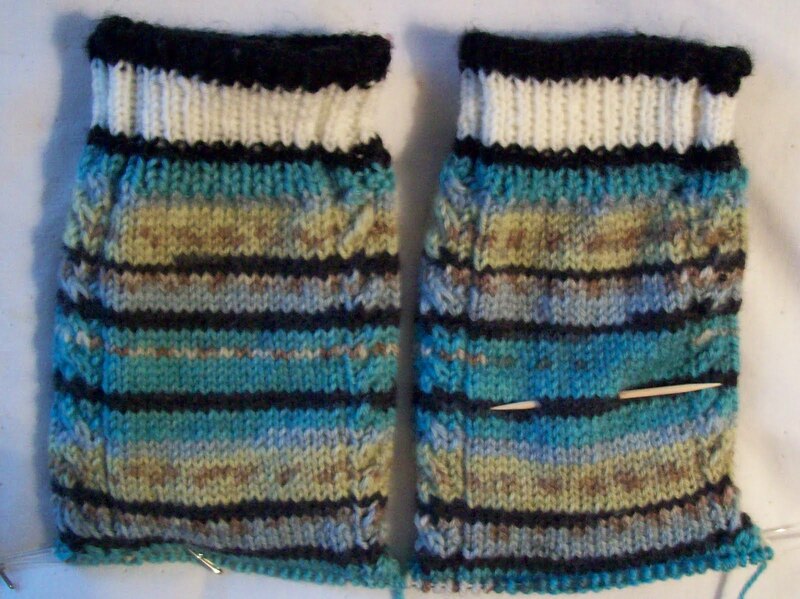 The socks are being worked with 64 stitches—(4 more than I would normally use) to create a bit of ease for the cables. 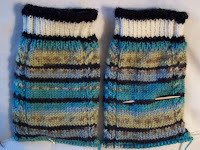 Before I started increasing for the gusset, I started working some ribbing in the back –I like socks that are snug at the back of the heel—contrary elements—increasing for ease and at the same time, ribbing for a snug fit! I haven’t decided (yet) if I will continue the ribbing all the way into the back of the heel—or if I will switch over to heel stitch when I get to the heel proper. The answer is new—or at least new to the local ACMoore’s stores in the NY area. A quick check to the Patons web page confirms—both that the color is new, and that I use Patons Kroy frequently! My City socks (December ’09) were done in the Slate jacquard color way, and I have the Tangerine Jacquard in the line up! The tangerine color way seem more coral than a pure orange—and coral is a color that works for me. --And that’s just page 1 of 4 pages of color ways—I don’t have them all –but wish I did. I like every one! Lucky (or unlucky?) for me—I don’t think every color is available locally! My City Socks (November ’09) and my Cascading Water socks (October ’09--a pattern for the same is available for sale on Ravelry—see the button in left hand column) were done in Kroy’s Fx. The Clover color way (forest green and other colors!) is also on deck for this year—I think I also like every color way in this line. I don’t remember exactly where/which store I bought any of these Kroy yarns in—there are several ACMoore’s in my ‘route”—one in Queen’s (next to the Stop and Shop) one in Westbury—a quick on and off the parkway when traveling through Nassau county—another on 107 and Hempstead (also Nassau county) —an alternate route from the south shore (Babylon) and the LIE (I-495) and home. Some times when there is a good sale (a coupon sale!) I will stop at all 3—40% off make money goes a lot further when you can get it 3 times! And most often, the stores are supplied by the same warehouse stock—and will often have the same dye lots! Kroy is very reasonable at $4.95 a skein—but its better still at $2.95! $6 or so for a pair of socks!—and it’s sales like that-- 40% off-- that have my stash of sock yarn growing faster than I can knit! But I do have a goal this year of some gift socks—(as well as all the socks I plan to knit for my self! )—and maybe I’ll knit more than I buy –at least for this year—but somehow I doubt it. Out side my door (at work) the forsythia is blooming—inside—my yellow daisy is dead—it lasted a full week—so I really have nothing to complain about—even if the weather has changed from balmy 60° to a more seasonal 45°. 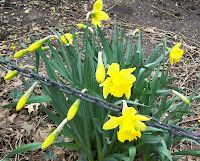 When I went closer to photograph the forsythia—I also saw that there are daffodils scattered here and about in the mall too. 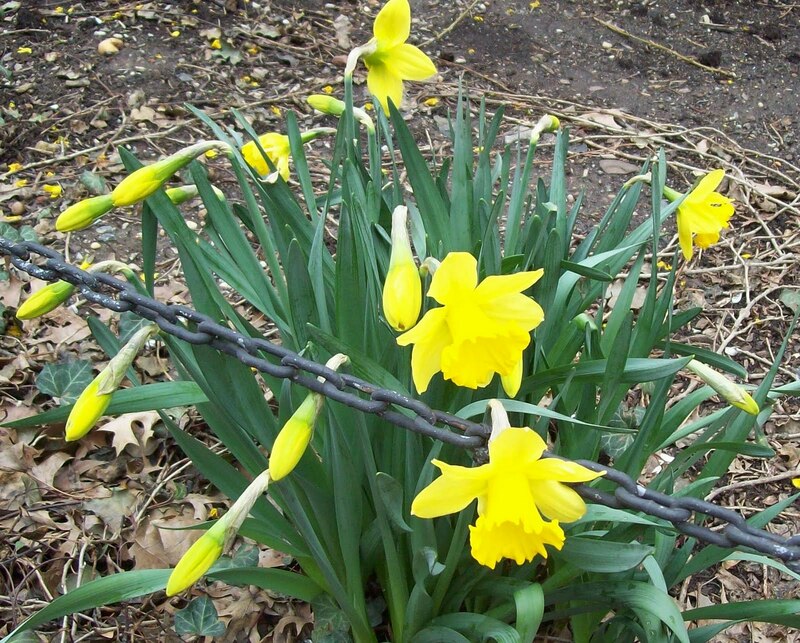 I love daffodils--thanks for the photo. Can't wait to see your finished socks. They are lovely! I always love watching your socks grow! Thanks for answering my query. I love Kroy and I'm always looking for new color combos. Your socks knit up look much nicer than their preview would suggest, too.